Whether you have been suffering from a double chin for your entire life or have developed bands and sagging skin of your neck with age, the plastic surgeons at The Oaks Plastic Surgery, Dr. Danielle Andry and Dr. Nandi Wijay use a variety of neck lift techniques to help you achieve a smooth, elongated neckline. 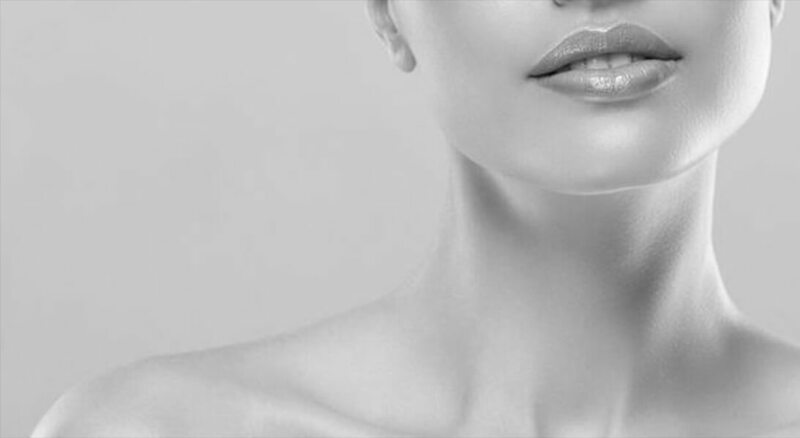 A neck lift refers to a variety of procedures used to contour and smooth the neck area for a graceful transition from your chin to your décolletage. When patients visit The Oaks Plastic Surgery clinic in Houston, TX to discuss neck lift, they are often talking about a few different issues that require different procedures. For patients who are complaining of excess fat, fullness of the chin or neck, or double chin, the plastic surgeons at The Oaks Plastic Surgery will often recommend neck or submental liposuction or performing a neck lift through a small incision that is well hidden under the chin to remove excess fatty tissue and create a smoother, slimmer neckline. This can also be done with non-surgical techniques including Kybella or filler to help balance the chin and jawline with your neck. Please refer to the page on Kybella or Chin Augmentation for more information about these procedures. In patients who have excess skin and neck bands due to age, a more traditional neck lift can be performed. During this procedure, the plastic surgeons elevate the skin and underlying tissues of the skin, then tighten the underlying muscle and soft tissues to restore a youthful neckline. Some excess fat and skin are often removed with this procedure to improve the neck contour. This type of neck lift is often performed with well concealed incisions behind the ear that sometimes extend into the hairline. Occasionally, an additional well-hidden incision under the chin is performed to repair muscle separation that occurs with age. Neck lift for the aging neck is typically performed under general anesthesia; however, in certain patients, neck lift or submental liposuction for double chin can be performed with local anesthesia in The Oaks Plastic Surgery office. The neck is one of the first places people start to notice signs of aging. Sagging of the neck and excess skin under the chin bothers many people making them feel old and unattractive. A neck lift is a powerful surgery that can reverse some of these signs of aging and give you a very natural, youthful appearance. In the digital age, selfies and social media have greatly increased the popularity of neck lift for double chin or excess fat of the neck area. Neck or submittal liposuction can greatly improve the contour of your neckline, making you appear much slimmer with an elegant, elongated, and youthful neck. The Oaks Plastic Surgery believes that a beautiful neckline is critical to a youthful, elegant look. For patients with excess skin of the neck, neck lift in combination with facelift is a great combination to rejuvenate your look and take years off your appearance. The plastic surgeons at The Oaks Plastic Surgery, Dr. Danielle Andry and Dr. Nandi Wijay believe in performing natural-looking rejuvenation techniques that gracefully restore your natural beauty, staying away from techniques that give patients an overdone appearance. The plastic surgeons at The Oaks Plastic Surgery use techniques that conceal scars without dramatically changing or creating step-offs in the hairline that are tell-tale signs of having a necklift. The goal of The Oaks Plastic Surgery is to make your neckline look rejuvenated and refreshed without looking like you’ve been to see a plastic surgeon. 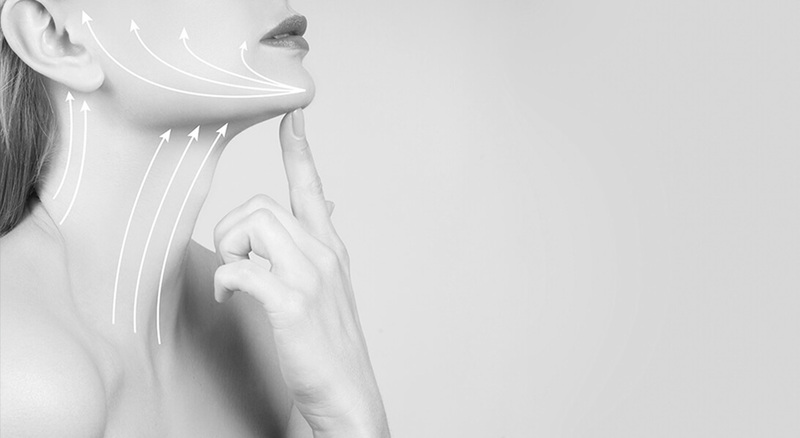 For patients seeking neck lift for double chin or excess fat under the chin, a few different techniques exist that can be tailored to fit your needs and preferences. If you desire a non-invasive, nonsurgical technique, Kybella can help improve your neckline. Kybella is medication that can be injected into the fat underneath the skin that works to dissolve the fat over time. Unfortunately, patients do not see an immediate result, and patients should expect to have some swelling and fullness in the area for 4-8 weeks. Kybella often gives modest, but build-able results and can be a good option in select patients. The preference of the plastic surgeons at The Oaks Plastic Surgery in Houston, TX is to perform liposuction of the neck or to perform direct removal of the fat through an open incision. The plastic surgeons have had more consistent, dramatic results with this technique and feel that this gives the best look. Although these patients do experience some swelling and bruising, in most cases, the change can be seen more quickly than with Kybella, and most often only requires one procedure to obtain the desired cosmetic outcome. What procedures are often performed with a Neck lift in Houston, Texas? Most commonly, neck lift is performed along with a facelift and/or fat transfer to help restore volume and youthfulness to the face. Additionally, neck lift is often performed with eyelid surgery (blepharoplasty), brow lift, and/or Botox, fillers, or chemical peel. For double chin, neck lift is performed mostly with liposuction or surgical excision of excess fatty tissues. This may be performed along with liposuction of other problem areas or with tummy tucks or other body contouring procedures. If you are having general anesthesia along with your neck lift, on the day of surgery, your plastic surgeon will meet you in the preoperative area to go over any last minute questions or concerns you may have. He/She may make some preoperative markings and will perform extensive safety checks and attention to detail ensuring high quality care and safety. You will meet the anesthesiologist and their team as well as the members of our operative team. During the procedure, our plastic surgeons pay meticulous attention to detail and work as a team to ensure a great result. Your family will be updated of your status periodically and will be able to talk with the plastic surgeon one-on-one after the cosmetic procedure is completed. If you are undergoing a full neck lift with or without facelift, operating room nurses will wash your hair after the procedure and place you in a post-surgical dressing. You may have a drain after the procedure, which is usually removed on the first day after surgery. Patients typically go home after surgery or stay one night in the hospital or surgery center. If you are undergoing neck lift or submental liposuction for double chin, there are typically no drains placed. You will be placed in a postoperative dressing and will be able to go home the day of the procedure. If you are not undergoing general anesthesia and are having your cosmetic procedure under local anesthesia only, your procedure will be done at The Oaks Plastic Surgery Office in Houston, TX. Our staff will bring you back to the procedure room and extensive safety checks will be performed to ensure quality care. Your plastic surgeon will go over any last minute questions you may have and may make some markings. Some numbing cream will be placed prior to any local anesthesia to decrease and pain you may feel from the local anesthetic injection. Our goal is to make you as comfortable and relaxed during the procedure as possible. After your cosmetic procedure, you will be placed in a surgical dressing and you will be able to go home the same day. A full neck lift typically takes between 2.5-3.5 hours whereas neck liposuction or removal of fatty tissues from the neck may only take 1-2 hours. On the first postoperative day, the staff or surgeons at The Oaks Plastic Surgery will remove any post operative dressings and/or drains, and you may shower after these dressings are removed. Pain after the procedure is modest and is usually well tolerated by patients. The plastic surgeons at The Oaks Plastic Surgery employ a multi-modal pain medication regimen to decrease or eliminate the need for narcotic pain medications. Swelling and bruising are expected for the first 2-4 weeks after surgery. Over the first few weeks, bruising may settle into the neck and chest. The surgeons at The Oaks Plastic Surgery recommend that you refrain from heavy lifting or strenuous activity for 2-4 weeks after surgery. Detailed instructions will be given to you preoperatively depending on your particular surgery. The results of surgical neck lift often last many years; however, these procedures only set back the clock. Aging and weight gain can result in recurrent symptoms that require revision procedures in the future.